Despite his international renown going back decades, Noam Chomsky is a deeply flawed political analyst. He’s always been treated like a rock star & his lectures are always packed out but that only highlights the folly of making demigods & legends out of people. No one is ever above political criticism. Except dictators. His lesser evil approach to the two politically bankrupt US parties (where he admits he would “absolutely” vote for Clinton) & his left Zionism on Israel with a contemptuous opposition to BDS are the most egregious of his failings but not the only ones. To his favor, he’s been honest in admitting that when it comes to knowing what to do, he’s at a loss. You can say that again. Political criticism & ideas tested in action are how flawed analyses can be corrected. But when you’re a Chomsky, deferred to like a rock star, that necessary process gets short-circuited. The serious political analyst should wish for no deference, no stature that puts them above democratic give & take or the corrective of debate & political experience. The dignity of the Nobel Peace Prize should have been sunk when Henry Kissinger won it in 1973 whilst the US was engaged in carpet bombing North Vietnam. It must have invested big money in public relations to recover from that one. Now the Drumpf has been nominated & there is a campaign to nominate Hillary Clinton for her work toward peace in the Middle East. It was Marx who said history repeats itself, first as tragedy, then as farce. Under neoliberalism, the barbaric phase of capitalism, tragedy has become indistinguishable from farce. Aung San Suu Kyi has finally laid her cards on the table. No more bewilderment about why the holder of the Nobel Peace Prize (a worthless honorific most often awarded war criminals), the democracy icon known as “the Mandela of Asia,” the holder of dozens of international honorifics as a champion of human rights has remained dead silent on the genocide against Rohingya Muslims in Myanmar. 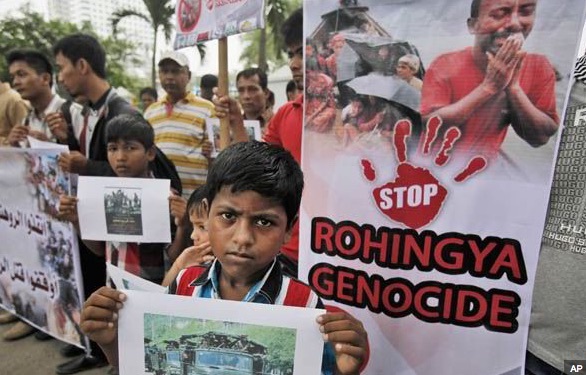 Media reports the conflict as primarily a religious one between Muslims & Buddhists but Rohingya have been subject for decades to violent state-sponsored persecution & discrimination conducted by the military, including denial of citizenship (though they have lived in the region for decades), religious persecution, forced labor, land confiscations, arbitrary taxation & various forms of extortion, forced eviction & house destruction, restrictions on travel for health & work, restrictions on marriage, education, & trade. The violence is so extreme & sustained going back decades that hundreds of thousands of Rohingyas flee for asylum to Malaysia & to squalid refugee camps in Thailand & Bangladesh. 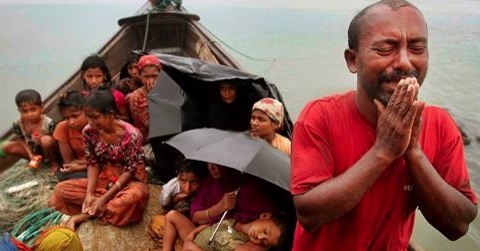 Myanmar now has forced nearly 150,000 to live in concentration camps. For years, Suu Kyi dummied up when reporters asked her about the genocide or answered in platitudes urging people to get along with each other or evasions calling for rule of law. Her evasions were taken as diplomacy even though it’s really hard to be a champion of human rights if diplomacy is your schtick. Usually daring & fearlessness are essential qualities of such champions, not cowardice or talking with marbles in your mouth. The US government is hardly the champion of human rights in all this. Hillary Clinton & Obama have both made high profile visits to Myanmar & paid homage to Suu Kyi as a human rights advocate. US multinationals are pouring billions of investment into Myanmar. If the US ambassador expresses any concern about genocide against Rohingya, it is only that the genocide not come back to interfere with those investments. Solidarity with Rohingya Muslims against genocide & for justice means educating about their struggle against genocide & part of that education requires exposing the murderous duplicity & collusion of Suu Kyi.